‘Bermondsey’s Own VC’, Fred Holmes, is honoured with a commemorative paving stone marking his birth place on Abbey Street outside what is now the Bermondsey Square Hotel. As part of activities to mark the start of the First World War in 1914, the Mayor of Southwark unveiled the commemorative paving stone on 26th August 2014. The event was accompanied by a military parade echoing events of nearly 100 years ago. Relatives of Fred Holmes also attended. Bermondsey Square Hotel and the Bermondsey Square Community Fund were pleased to be able to support the commemoration of this brave son of Bermondsey. 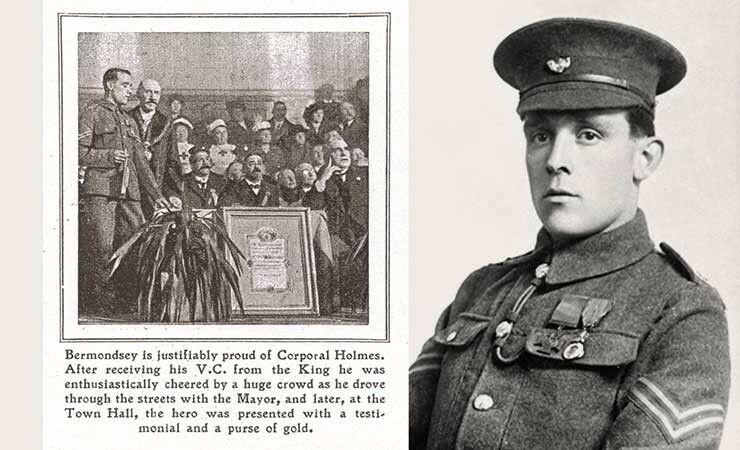 Bermondsey-born Fred Holmes was one of the first soldiers to receive the Victoria Cross (VC) in the First World War. He was awarded the VC for two acts of bravery on 26 August 1914 during the Battle of Le Cateau just weeks after the start of the war. Whilst under heavy fire, L Cpl Holmes carried a badly wounded soldier, Norman Woodcock, out of the trenches on his back for two miles until he reached some stretcher bearers. Holmes then returned to his battalion to find many of them killed or wounded and a gun in danger of being captured by German forces. He placed a wounded man on one of the horses of an artillery gun team and attempted to take him to safety. Unfortunately the man fell off and was lost in the dark, but Holmes reached safety with the gun. The Battle of Le Cateau was fought after the British and French retreated from the Battle of Mons and had set up defensive positions in a fighting withdrawal against the German advance at Le Cateau-Cambrésis. The total British casualties at Le Cateau amounted to 7,812 of all ranks, killed, wounded and missing. 38 field guns were lost. Yet the engagement at Le Cateau had achieved its objective and enabled the British Expeditionary Force to retreat unmolested by the Germans for a further five days. He was also awarded the Medaille Militaire (MM) by the French Republic for a second and separate act of bravery. On the 100th anniversary of the start of the First World War, the Department of Communities and Local Government (DCLG) has invited all local authorities to honour all Victoria Cross (VC) recipients. Commemoration paving stones will be laid in or as close to the birth place of Victoria Cross recipients to remember the act of valour which led to the award. Fred Holmes was invested with his Victoria Cross by King George V at Buckingham Palace on 13th January 1915. After his investiture, he was driven through the streets of Bermondsey with the Mayor, and later, at the Town Hall, he was presented with a testimonial and a purse of gold. He was hailed the Bermondsey Hero. After leaving the army in 1924 he fell on hard times before emigrating to Australia. He died a year after his wife in 1969. On 26 August 2014, L Cpl Holmes’s old regiment the 2nd battalion of the Kings Own Yorkshire Light Infantry successor battalion plan a commemoration at the Royal Armouries in Leeds. In Australia, Port Augusta RSL is planning a commemoration at his graveside. Fred Holmes also features on the cover of a commemorative set of Royal Mail stamps marking the anniversary of the start of the First World War. A special postmark will also be available on 26th August.